Yellow Sapphire is one of the precious and costly gems. 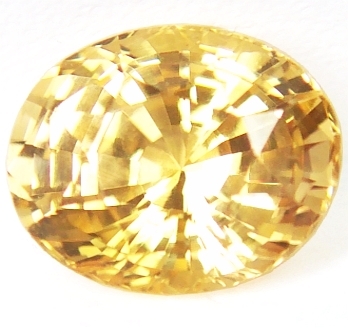 This gem is found in light yellow color. Yellow Sapphire is an aluminum oxide. In astrology, gem stones are recommended on the basis of placement of planets in a horoscope. Jupiter is the biggest planet in our solar system and signifies knowledge and philosophy. This also denotes justice, wealth, children, religion, long journeys and pilgrimage etc. Yellow Sapphire governs this planet who is lord of two Signs namely Sagittarius and Pisces of the zodiac. Jupiter is the fifth planet from Sun and emits yellow color. Negative Jupiter gives negative results. The person may be dishonest and may face humiliation etc. in life. The result will be the same if Jupiter is posited with malefic planets or it has the aspect of malefic planets in the chart. In family relations, this signifies senior members of the family. Powerful Jupiter blesses the person with success in every field of life due to his good luck, fortune and wisdom. Yellow Sapphire should be worn if Jupiter is giving weak results in the chart. Yellow Sapphire ensures success and enhances positive energy of Jupiter. Relations with senior members as well as with the teachers are improved and the wearer gets co-operations and blessings of elders. The most suitable profession of Jupiter is teaching. Teachers, lecturers, professors who distribute knowledge to the students get blessing of Jupiter. If Jupiter is weak by placement in the chart or is in debilitated state or is in enemy sign, the desired results of Jupiter as well as the house it denotes cannot be expected. The person lacks knowledge and wealth and suffers from instability, humiliation and failures. He can also be a liar and cheat. Gems affect the subtle energy field of human being. (To understand subtle energy, see our article Theory of Subtle Energy). Our energy and thought process and accordingly the actions (karmas) are governed by this subtle energy. If malefic planets are posited with Jupiter, or Jupiter is placed in 6th, 8th or 12th house of a chart, Yellow Sapphire should be worn. But finally before wearing this gem, the horoscope should be got analyzed by learned Astrologer because sometimes Jupiter gives malefic effect by virtue of placement even though he is considered a most benefic planet. Yellow Sapphire is extremely beneficial for writers, philosophers, teachers, professors, surgeons, politicians and researchers etc because this gem increases wisdom and wealth. In Indian System, Jupiter also signifies husband for a married lady. Jupiter also helps in getting married in time. Girls, whose Jupiter is badly placed or is posited with the malefic planets, faces difficulties in getting suitable match for marriage. Their marriage is delayed and sometimes disharmony surfaces in married life later on. Negative, malefic or weak Jupiter denotes many diseases like liver and kidney problems, gouts, jaundice, hernia, obesity, rheumatism and even heart problems. By wearing Yellow Sapphire gemstone, a man can overcome these problems. Yellow Sapphire should be embedded in Gold and ring should be worn on Thursday morning (Shukla Paksha) after dipping the ring in Gangajal or un-boiled milk and energizing the Gem with the prescribed mantras. Yellow Sapphire is considered pleasant and soothing gem by nature.